tobyMac wants to start a revolution, one that will sweep through cities and erase the divisive lines that keep people and cultures apart. Holding up his microphone like a fist in the air, this Grammy-winning artist sees his opportunity in the society-shaping power of music. As a true artist, it's not his impressive sales heights or awards that fire up his voice, but rather it's an unwavering quest to make songs that connect and inspire all who hear them. Crafting the perfect songs to match his vision, tobyMac ignites the first spark with Welcome to Diverse City. 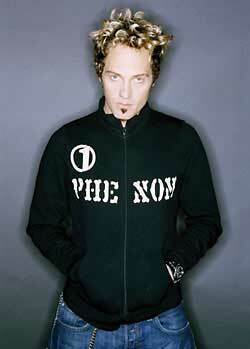 Accentuating his celebrated career with dc talk, tobyMac made his solo bow in 2001 with the Grammy-nominated Momentum. The disc marked a return to tobyMac's hip-hop roots, the very style with which dc talk first emerged, and yet the rapper-singer once again finds himself branching out from this base. As the title implies, Diverse City is an album bursting with musical flavors and nuances, and yet this stylistic blend finds unity through faith as it's threaded through a melding urban rock and hip-hop frame. Reaching into a world of different sounds and cultures, this album knits it all together with a genuine artist's touch. "I'm not on a mission to flex musical diversity as much as possible, but I don't fear it," admits the emcee. "I don't fear where the music is taking me. There's a blending going on as I drop it all in the pot making what I call musical gumbo." Case in point, the title track recalls a time when disco rolled into funk and groups like the Gap Band and Parliament rocked the perfect party soundtracks. Building upon this throwback style, tobyMac infuses new life with raps, hooks, and melodies that transform the party energy into a celebration of races united as a single city on a shining hill. After moving feet with its retro revival touches, the album trades in the dancing shoes for bangin' heads as "Slam" and "Phenomenon" surge with rock guitars, explosive vocals, and anthem-like choruses. Then, as a song that feels like summertime in a cup, "Gone" uses a progressive west coast pop style to tell about a friend who gave her disrespectful boyfriend the curbside-kick. "My style is diversity, it always has been," says tobyMac, who co-produced the album along with such notables as Chris Stevens, Paul Meany, Robert Marvin, Mike Linney, Joe Baldridge, and Solomon Olds. "It's about taking hip-hop and injecting pop melodies and guitars and harmonicas and whatever else it takes to make the song fit the message I'm trying to communicate." In regards to the message, the new album reflects a shift in the way he expresses ideas. Whereas past albums tended to tackle issues in a more universal manner, Welcome to Diverse City takes a closer look at specific people, sometimes himself, problems, and situations as real life backdrops to the lyrics. This approach, which exudes a more personal touch, adds empathy to a tale of loneliness ("Atmosphere"), urgency to a call for change ("Getaway Car"), and humor to a frustrated confession of days short on time ("Gotta Go"). The album's most personal song, "Burn For You," even tackles the renewed life that tobyMac experienced after adopting twins two years ago. "In the past I dealt head-on with social issues, but I'm starting to see that social issues come down to real lives," says tobyMac. "As you dig into personal issues and find resolve in God, social issues will begin to take care of themselves." Throughout the 90s, tobyMac achieved considerable success with his Grammy-winning group dc talk, stockpiling a number of gold and platinum albums with seven million combined copies sold. As the group moved into the rearview window, tobyMac boldly stepped out on his own with his solo debut, Momentum. Earning rave reviews from Billboard to CCM Magazine, the 2001 album debuted atop the Billboard Heatseekers chart, sold over 400,000 copies, and landed two number one singles, "Extreme Days" and "Somebody's Watching Me." The DC-born artist went on to win several Dove Awards, including Producer of the Year, and two BMI honors as Christian Songwriter of the Year. In 2002, tobyMac complemented his debut with the holiday single This Christmas and the Momentum DVD, while Re:Mix Momentum, which delivered three more Top 10 hits, followed in 2003. That same year, Momentum lived up to its name as tobyMac topped CCM Magazine's 25 Most Important Artists Shaping Christian Music Today and placed fourth on their 25 Powerful People Who Have Made Christian Music What It Is Today. He also made the cut for Christian Radio Weekly's 50 Most Influential People Today and was named one of the Top 50 Evangelical Leaders of This Generation by Christianity Today. During these past few years, tobyMac toured incessantly as a headliner in addition to co-headlining with Kirk Franklin and sharing stages with Third Day, among others. Showing everyone he's more than just "talk," tobyMac put his artistic vision and values back into action with Welcome to Diverse City, another album living up to its title. "People fashion a great city by holding tight the beauty of our differences with the bonds of our unity," he concludes. "My new album invites people to ponder how they relate to each other and to God and how He relates to them, but at the same time, I know it's gonna drop a bomb that'll make any listener feel the energy. Now that's celebrating Diverse City!